Put the rice and quinoa in a pan. Add 320ml water, bring to the boil, cover with a lid and turn the heat down as low as it will go. Cook for 12-15 mins, or following pack instructions (brown sushi rice will need longer), by which time all the water should have been absorbed. Meanwhile, heat the vinegar, sugar and a pinch of salt until the sugar has dissolved. Stir the vinegar mixture into the cooked rice, then gently move the rice around to let out some steam. The rice should be sticky rather than wet when cooled. Heat the oil in a non-stick pan. Fry the sweet potato for 2-3 mins each side until just cooked, then season and set aside to cool. When the rice is cool, divide between two small bowls (or lunch boxes) and level the surface. 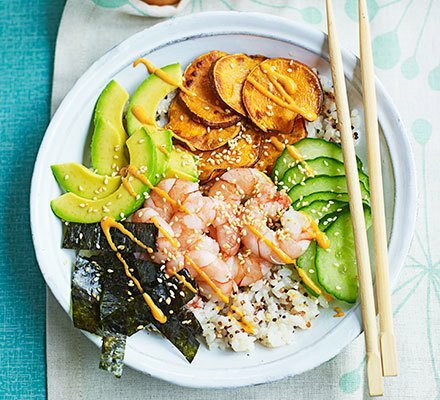 Halve the prawns lengthways, then arrange on top of the rice along with the rest of the toppings. To serve, squeeze over some spicy mayo in a zigzag and sprinkle over some sesame seeds, if you like.